More information on The New Zealand Centre for Human Rights, Law, Policy and Practice. ‘Equality for some: the challenge of poverty in Aotearoa New Zealand’ was the topic of a panel presentation and discussion convened by Hanna Wilberg, Associate Dean (Equity) as part of the Substantive Equality Month 2018 at the University of Auckland Law School. Max Rashbrooke, Susan St John, Harry Fatu Toleafoa, Shiloh Groot. Photo by Claudia Chilcott courtesy of the NZ Law Society. 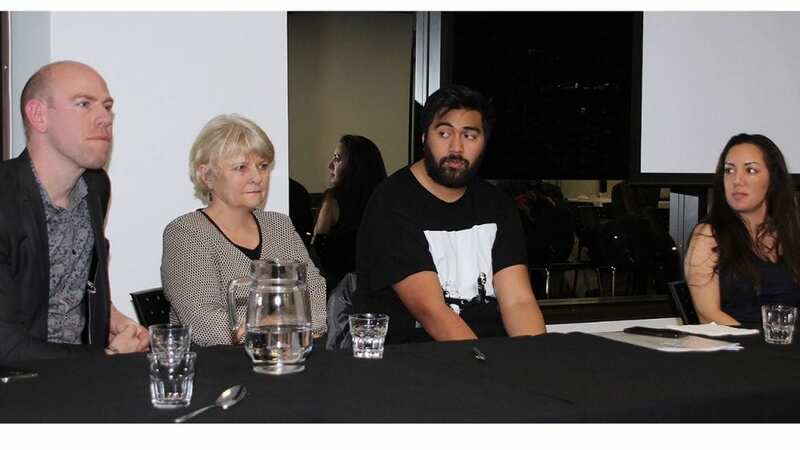 This event was hosted by the New Zealand Law Society (thank you, Glenda McDonald), and chaired by Associate Professor Treasa Dunworth, on 31 July 2018. New Zealand prides itself on its commitment to a fair go for all. But ever increasing levels of poverty, deprivation and the raft of associated inequalities are challenging that image. Access to justice, educational opportunities, housing and other fundamentals we take for granted are greatly impaired as a result. A panel of four speakers with extensive experience in this area share their experiences and thoughts on these problems. Below you may find the notes provided by the panellists at this event. Max Rashbrooke is an author, journalist and academic. He is the author of Wealth and New Zealand (Bridget Williams Books (BWB) 2015), and edited the best-selling Inequality: A New Zealand Crisis (BWB 2013). He is a Senior Associate of the Institute for Governance and Policy Studies at Victoria University of Wellington, with research interests in wealth inequality and open government. As a journalist, he has written for outlets in Britain and New Zealand including the Guardian, the National Business Review and Metro. He has twice been the recipient of the Bruce Jesson Senior Journalism Award, and was a 2015 Winston Churchill Fellow. His new book Government for the Public Good, out in September 2018, is on the renewal of government in the twenty-first century. Shiloh Groot (Ngāti Pikiao, Ngāti Uenukukōpako) is a Senior Lecturer in Social Psychology at the University of Auckland who works in the fields of Indigenous/Māori worldviews and communities, and homelessness and urban poverty. Shiloh is a long-standing member and former co-chair of the Tangata Whenua Caucus for the New Zealand Coalition to End Homelessness (NZCEH), where they have been asked to advise on the expansion of research strategies that will inform the development of national policy and service provision. Harry Fatu Toleafoa is an LLB graduate from the University of Auckland. He currently works at the Mangere Community Law Centre as a community advocate and legal educator. Over the past ten years he has worked in a number of Pacific community organisations in West and South Auckland. Understanding income inequality is incredibly important as its effects are becoming more evident in the various communities he works alongside. Susan St John BSc, MA, PhD, QSO has had a career in teaching including 35 years at the University of Auckland teaching economics and public finance and policy. She is an Honorary Associate Professor, half-time economics policy analyst for Child Poverty Action Group, and half-time director of the Retirement Policy and Research Centre at the Auckland Business School. She has written extensively on Superannuation policy including work on the affordability of NZ Super, intergenerational equity, the lessons of KiwiSaver. Her interest in inequality includes analysis of child poverty policies, taxation, especially the taxation of housing and the inequality of wealth, and the value of social insurance. Her webpage is here with current blogs. When we discuss poverty, we often discuss it in isolation. But I think of poverty and wealth as being like two ends of a seesaw: you can’t understand what is going on at one end without understanding what is going on at the other. If you look at the graph (figure 1 below), you’ll get a sense of what I mean. It shows what has happened to people’s incomes, once you adjust for inflation, between 1982 and 2016. Someone in the poorest 10th of the country has not seen much increase in income – they rise from around $12,000 to $14,000, after tax. But the typical New Zealander, the person in middle of the country in terms of income, hasn’t been doing very well either. Their income has gone from around $27,000 to around $36,000 after tax. Someone within the richest in the country, in contrast, has seen their income almost double, from around $60,000 to $115,000, after tax. And someone in the richest 1% of the country has also doubled their income – before tax, in this case, but still a very sharp increase. This increase in inequality – incomes remaining stagnant for much of the country while doubling for the richest – was the biggest anywhere in the developed world between the mid 1980s and the mid 2000s. And it helps us see poverty in context. What we have done in the last 30 or 40 years is construct an economic system in which the bulk of the rewards go to people who are already doing well. Consequently there is not much left over for others. To understand the connection between wealth and poverty, it helps to think about specific mechanisms. In the last few decades, the share of company profits that goes to the workforce has declined sharply, from around 60% to around 50%. Those profits are going instead to the people own business: shareholders, company owners, banks, and so on. Those people are getting a larger share of company profits because the power balance in the workforce has shifted. Without trade unions to represent them, many people are unable to demand their fair share of profits. That’s a story about inequality of income, in the sense of the flow of money people have coming week to week or month-to-month. If we look at the second image, we can see inequality of wealth, in the sense of the stored up assets that people own. Here (figure 2 in the pdf at the bottom of this page, and from The Spin Off), wealth in New Zealand is portrayed as a 10 storey building. The wealthiest 1% owned 22% of all assets, so they would have the top two stories all to themselves, even though they are a small number of people (about 37,000 adults). The next 9% of adults own another 40%, roughly speaking – again, a disproportionate amount. The next 40% of adults – the middle classes – have about 40% of all wealth, the same as they would have in a perfectly equal society. But that leaves the poorest half of all New Zealand adults – around 1.8 million people – with just 2% of all wealth. That means they are, metaphorically, crammed into less than half of the basement. Again, you can think of mechanisms that connect top and bottom. Housing is a major source of wealth. If you’re at the top, you’ll own property. That property increases in value year after year without your doing anything, and when you sell it you generally don’t pay any tax. So the system is helping you accumulate ever greater amounts of wealth. Conversely, many people at the bottom have no choice but to rent, and rising rents often take up over half of their incomes. So they have little hope of building up wealth or owning a home. We are at an unprecedented point in Aotearoa New Zealand history, we are finally seeing the political will and a resourced commitment to responding to homelessness. However, the lack of focus on structural issues driving homelessness is short-sighted. Homelessness is not a neutral state, but rather one that is intimately interwoven with other experiences of being on the margins of society. No nation is a blank historical slate, but we often treat Aotearoa New Zealand as if it were. Māori whānau are over-represented in this group and therefore any approach working with providers to inform services will have a direct bearing on Māori. These are, after all, disparities caused largely by the Crown’s own colonising, discriminatory and marginalising acts. We have experienced over 160 years of attempts to displace us from our hau kainga (ancestral homelands). Homelessness for Māori has occurred at national, iwi, hapū, whānau and personal levels. 1. What does poverty and marginalisation look like in the everyday lives of Māori? 2. What are the everyday restraints on human flourishing faced by Māori? 3. How do Māori draw on cultural connections and practices to cope and push against the boundaries of their restrained lifeworld’s? 4. What are the practical implications of a deeper understanding of poverty and homelessness for the promotion of human flourishing? Our work seeks to disrupt the complacency that can come with the comforts of being an academic and forge a stronger path towards realising core aspirations for Māori to live well, to leave improved legacies for future generations, and to remain distinctly Māori. Documenting a clear understanding of homeless peoples’ daily lives and working with service agencies enables us to enhance efforts at supporting the housing and relational needs of Maori and other homeless people. The public perception of Māori homelessness is shaped by longstanding prejudices against populations whose lives are lived on the margins of society. What’s missing in many responses to the issue is a human account of homelessness, that enhances the mana of whānau experiencing hardship. Alternatives to oppressive welfare exist and the current government will need to engage more with these. What we do know, is that a focus on human rights, that adopt anti-oppressive orientations, and promote human flourishing are sustainable. In recent years fierce debates surrounding a housing crisis has brought attention to the oft ignored societal issue of homelessness in Aotearoa New Zealand. However, homelessness is a complex issue that is about much more than just having access to four walls and a roof. In Aotearoa New Zealand the definition of homelessness includes the social, physical and legal domains as they intersect with housing (Statistics NZ, 2009). It is important to emphasise, that homelessness is NOT just a lack of shelter, it is the absence of safe, secure and habitable shelter. However, the unique needs of indigenous peoples are often excluded from such official definitions. Broadening our understanding of homelessness to include spiritual dimensions acknowledges that for Māori, homelessness includes shared histories of removal from ancestral lands, language, cultural practices, and family and kinship networks. Without such understandings, we risk depoliticising homelessness and reducing it to poor personal choice. A University of Otago report using conservative figures drawn from the 2013 census suggest that close to 1 in every 100 New Zealanders are affected by homelessness. Most homeless people originate from whānau living in poverty, and homelessness can be seen as the hard edge of inequality in Aotearoa New Zealand. Pathways into and out of homelessness are complex. Specific pathways include growing up in low income households, experiencing racism in the rental market that can impact the length of time spent in any one house, and poor quality, overcrowded and unaffordable housing. Frequent upheaval and movement between communities and schools can further disrupt children’s and young people’s educational performance and community support networks. For many Māori we engaged with, life on the street in some ways offered a greater sense of stability and control than domestic alternatives ever had. In contemporary Aotearoa New Zealand, such colonial histories carry grave consequences for health and identity. To illustrate the intersections of these issues, we have drawn on the accounts of Māori homeless people we engaged with through our research in Tauranga, Hamilton and Auckland. Through their stories, we considered the hardships that haunted them, and the strengths that restored them. If Māori are over represented in the homeless population, then we need to ensure Māori perspectives are interwoven into any response strategy, to provide the bridge between past and current contexts of homelessness and a future ideal state where homelessness does not exist. • Institutionalised racism within the social welfare, child-welfare, mental health, public health, education, juvenile-justice and criminal-justice systems further embed experiences of homelessness for Māori. Community driven and centred approaches are needed. A paradigm shift needs to happen and Te Ao Māori (the Māori world) provides a wealth of cultural concepts that can transform current systems when meaningfully integrated. Such an approach emphasises the restoration of community, self-belief, and communication without judgement. Groot, S., Van Ommen, C., Masters-Awatere, B. & Tassell-Matamua, N. (2017). Precarity: Uncertain, insecure and unequal lives in Aotearoa New Zealand. Auckland, New Zealand: Massey University Press. – NEET status is an important economic and social risk factor indicating disengagement in the labour market and education system. • It’s not at the immigration borders but in the maternity wards where in Auckland 1 out of every 4 babies are Pacific, same as Asian and 1 out of 5 are Maori. • If we fail to address the inequalities of these minorities we will be facing problems to come in the near future. • Carry out all the financial literacy and capability programmes – but if there’s no money to budget. Average rent in Mangere for a 3 bedroom home cost $500: that’s a substantial amount of your income, not even including your necessities etc. • Social mobility becomes unattainable and generational earnings elasticity grows. • Impacts on health, The Spirit Level, Professors Richard Wilkinson and Kate Pickett: Psychological and physical stress – comparing ourselves to others = a powerful and insidious force = when coupled with material poverty. In 2012, the United Nations Committee on Economic, Social and Cultural Rights identified structural discrimination causing inequalities in New Zealand and urged the Government to address it. The State Services Commission describes structural discrimination as occurring “when an entire network of rules and practices disadvantages less empowered groups while serving at the same time to advantage the dominant group”. Structural discrimination affects everyone, because it is a system of allocating and maintaining social privilege. Those who are marginalised by this system face socio-economic disadvantage and political isolation. National structures are evolved which are rooted in the values, systems and viewpoints of one culture only. Participation by minorities is conditional on their subjugating their own values and systems to those of “the system” of the power culture. – Judges conference: we are the authors of our own salvation. 5. Bold – poverty is something that has always existed. Not a one off event. We often hear the myth that it just doesn’t matter how much the super wealthy have, if the poor have enough. Max shows there are strong interconnections. The super-rich are rich today because they have benefited from low wages/ high rents/ poor policies and low taxes. The poor are so poor because they have suffered low wages/high rents/poor policies and high taxes. If the compounding good fortunes of those at the top are tied to the compounding misfortune of those at the bottom- the problem will NOT be solved by looking at the lower end only. Of course housing is key—the failure to tax housing properly is critical. But, after decades of buck passing will the new Tax Working Group deal with this problem or once more sweep it under the carpet? Capital gains tax (CGT)/land Tax/Risk free rate method or net equity tax were all examined in 2010 and all declared too hard. Many people have made much more money on the Auckland property market than from their real job. This has huge implications. CGT is an easy answer but we are concerned with inequality tonight and a CGT, even if possible, does not get at the accumulated capital gains the well-off have enjoyed. A net equity tax would be much fairer and can be made progressive but is there time for this debate? One reason inequality has crept up on us I think is the lack of understanding of the concept of social insurance and why we need a welfare state. As a result the mechanisms to reduce inequality have been vulnerable to attack and neglect. Most people understand that the welfare state is supposed to prevent or ameliorate poverty. But its key function is the provision of insurance that individuals would be unable to purchase in the private market i.e. for when they get sick/have an accident/have children/lose employment/grow old/need care etc. We have been very successful with NZ Super which protects against living a long time and inadequate saving. We have also been pretty successful with ACC, a major social insurance programme, somewhat less successful with health and education, and very unsuccessful with family-programmes and welfare. There is a contorted debate over Working for Families (WFF) because so few understand it as a major redistributive programme for children and their unpaid caregivers. Unedifying debates between Mathew Hooton and others who write about WFF as communism by stealth or corporate welfare fail to acknowledge its vital insurance role as a payment for children. I grew up in the post war period—some children at school were ragged but overt poverty was rare. In the 1970s we had amazing raft of social reforms, such as the DPB (Domestic Purposes Benefit), ACC and National Superannuation. Then in the 1980s the tax scale was flattened and a comprehensive GST introduced. By the late 1980s Rogernomics was cemented in with the devastation of the 1991 Budget. A cut to traditional social expenditure forced the better-off to pay for their own social provision. Tax cuts for the wealthy and welfare only for the poor was supposed to produce trickle down benefits. The narrative began about how paid work was the answer to poverty—only it wasn’t. A complex array of targeted provisions were introduced that produced damaging poverty traps as people earned extra income. Instead we reaped the whirlwind of poverty and inequality. The chickens are coming home to roost for the wealthy from this Faustian bargain. Low taxes—slashes to public spending on universal aspects of education/health/welfare and user pays. In 1991 a number of us were asked to write a piece for the Dominion Post- looking ahead ten years and pondering on what we expected to see. Rodney Hyde gleefully predicting government spending would be a tiny 3% GDP – his Nirvana. My contribution got me into trouble as it was the most pessimistic, predicting deep poverty traps and widespread family poverty. That outcome sadly came to pass—and now another 10 years on, unbelievably, things have got worse, as any scan of the local paper or trip down Queen St or visit to the Auckland City Mission will reveal. People did not understand the balance sheet implications of the 1990s changes. It is that compounding of disadvantage and our inability to see that every year families don’t have enough to live on, the run down of assets or accumulation of debt increases, making the fixing of the problem so intractable and intergenerational. During the 1990s and 2000s we had iterations of the Roger Douglas model. The extreme version emerged under National- tax cuts and more targeting would have seen a typical low income family on $35,000 face an effective tax rate of 80% or more over long income ranges. The Families Package introduced this July is more of a catch up for inflation than a solution. Repayment of large student debts interacts with WFF and housing assistance abatements and loss of other social provision making the poverty trap worse for some families. Restoring balance sheets is critical to providing a better environment for children to grow up in. Active housing policy, debt forgiveness programmes, reintroduction of Kiwi Saver kick start, and a more generous working for families are some of the ways we can begin but there is a huge amount to do! Notes from the panel.Size: 432.5 kB.TYPE:PDF. Document Description:Text and images from the speakers Max Rashbrook, Shiloh Groot, Harry Fatu Toleafoa and Susan St John. Download this PDFfile. SIZE:432.5 KB. Susan St John, Shiloh Groot, Max Rashbrooke and Harry Fatu Toleafoa. Photo by Claudia Chilcott courtesy of the NZ Law Society.